Its brilliant cultural life declined during the period of Communist rule (1948-89) but experienced a revival with the restoration of democratic government in December 1989. 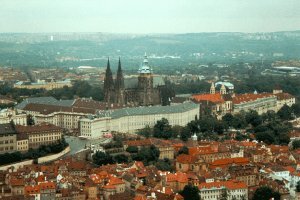 Prague is the political, administrative, financial, and commercial heart of the Czech Republic. The importance of the theater in Praque is symbolized by the fact that it was a playwright, Vaclav Havel, who led the fight to overthrow Communism in 1989. Music has played an equally prominent role in Prague's tradition. It has two major orchestras-the Prague Symphony and the Czech Philharmonic, with its distinguished conductor, Vaclav Neumann. The annual Prague Spring Music Festival is world renowned. The largest of its many art galleries and museums is the National Museum, founded in 1818. 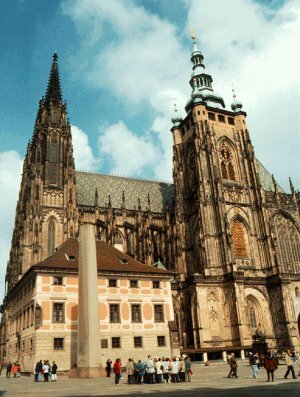 The city has nine institutions of higher learning, including the prestigious Charles University (1348), the oldest in central Europe. The writers Franz Kafka and Jaroslav Hasek, who lived in Prague, epitomize for many the spiritual character of the city. Dating from medieval times, the old center of Prague consists of five sectors. The Old Town, the New Town, and the Josefov (once a Jewish ghetto) are on the eastern bank of the river. Located on the western bank are the Lesser Quarter and the Hradcany, which surround the majestic complex of Hradcany Castle--former residence of the Czech kings and since 1918 the seat of Czechoslovakia's presidents. The oldest of the bridges spanning the Vltava is the Charles Bridge, begun in 1347. Despite gradual modernization, Old Prague has retained much of its original appearance, with narrow streets and many historic buildings in the Gothic and baroque styles. Palaces of the old nobility now house government offices and embassies. Prague suffered little damage in World War II and has about 1,700 officially designated historic monuments. Other noteworthy sights of Prague: Jewish Cemetery, Parisian Street, Wencels Square.